The Symposium (Ancient Greek: ??µ??????) 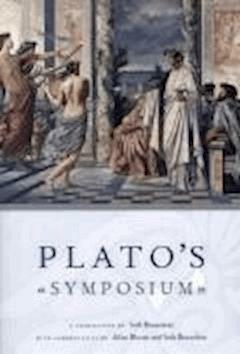 is a philosophical dialogue written by Plato sometime after 385 BC. It is a discussion on the nature of love, taking the form of a group of speeches, both satirical and serious, given by a group of men at a Symposium or a wine drinking gathering at the house of the tragedian Agathon at Athens. The sexes were originally three, men, women, and the union of the two; and they were made round—having four hands, four feet, two faces on a round neck, and the rest to correspond. Terrible was their strength and swiftness; and they were essaying to scale heaven and attack the gods. Doubt reigned in the celestial councils; the gods were divided between the desire of quelling the pride of man and the fear of losing the sacrifices. prophecy glimpses of the future may often be conveyed in words which could hardly have been understood or interpreted at the time when they were uttered (compare Symp. )—which were wiser than the writer of them meant, and could not have been expressed by him if he had been interrogated about them.